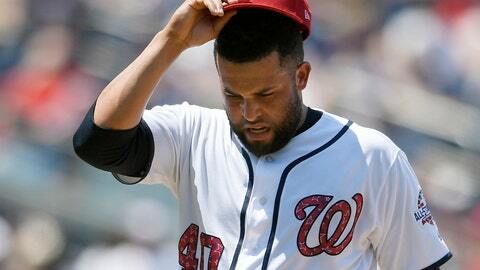 WASHINGTON (AP) — Nationals right-hander Kelvin Herrera was placed on the 10-day disabled list Wednesday with a right rotator cuff impingement, a move that further thins the back of Washington’s bullpen. With Doolittle and Herrera out, the closer becomes right-hander Ryan Madson, who’s 2-4 with a 4.32 ERA and has converted four of six save opportunities. Doolittle took the boot off his left foot Wednesday and threw gingerly. Although the Nationals certainly could use the left-hander, who has 22 saves and a 1.45 ERA, they won’t rush him back. “We want to make sure he’s healthy and nothing goes backward on him,” Martinez said.